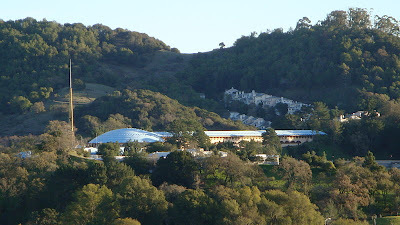 Several years ago, Husband Walter and I were traveling U.S. 101 in Marin County, California, when I spotted an impressive expanse of blue roof undulating across hilltops and valley. I doubted I was seeing a huge version of the blue tarpaulins that offer temporary and sometimes effective protection for hurricane-damaged roofs in our coastal Mississippi region. Thanks to a free tourist tabloid I picked up during our October 2012 West Coast trip, I learned that the striking blue is the roof of the Marin County Civic Center. 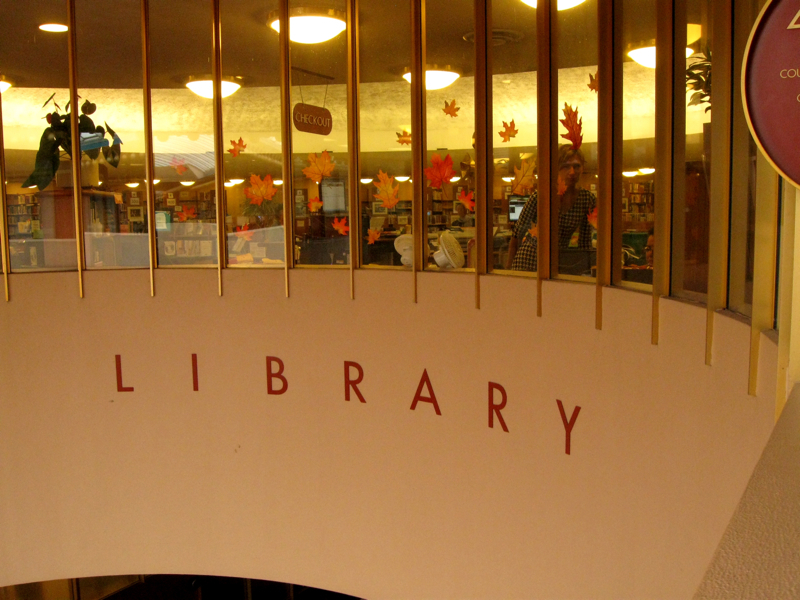 Famous American architect Frank Lloyd Wright designed the center, and it was constructed after his death. 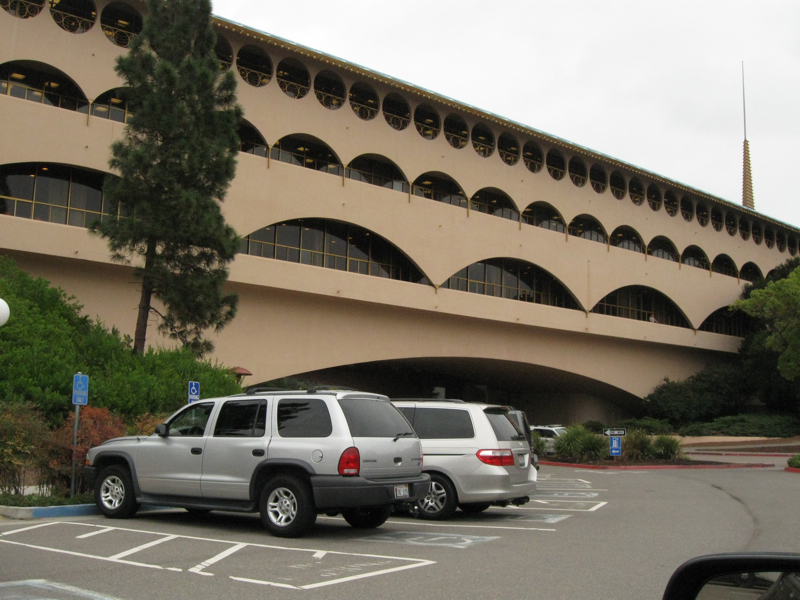 We started our Oct. 12 San Francisco Bay Area sightseeing at the civic center. 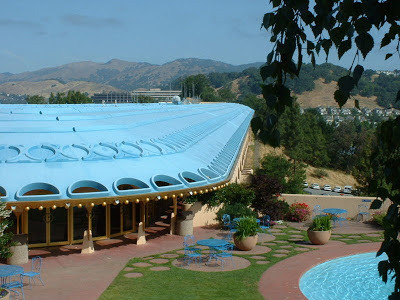 Both photos above of the civic center's blue roof are via Wikipedia Commons. We didn't encounter the rooftop view above. After our trek uphill from the parking space we finally found and exploring for a bit in the county administration wing, I was ready to sit and rest, snapping occasional pix through the windshield or cajoling Hubby to grab a shot out his window with my camera as we drove around the complex. The ground level arches supported arches in decreasing sizes on subsequent levels. 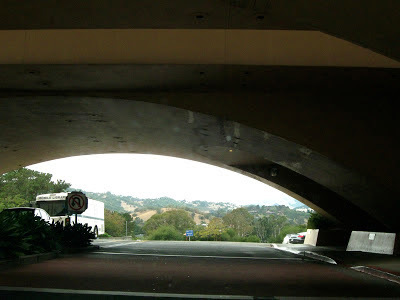 The arched drive-through intentionally framed a view of Marin County terrain. Inside, an atrium provided an abundance of natural light. Wright’s interior design had specified transparent panels instead of walls for county offices, representing openness in government. Those panels looked opaque rather than transparent. What's your idea about the possible symbolism of that opaque white instead of transparent? Of course, if I were a county employee, I would want no strangers observing my spells of pulling my hair out and ranting about an uncooperative computer. As much as I found the exterior attractive, the interior was interesting but seemed sterile and unwelcoming, even with the wonderful light from the skylight. 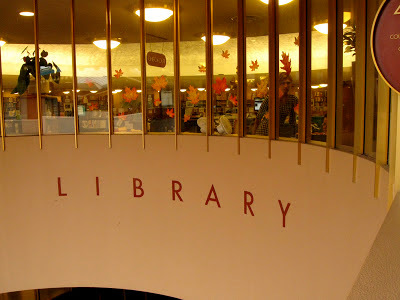 A county library served up the only atmosphere of welcome that I experienced. 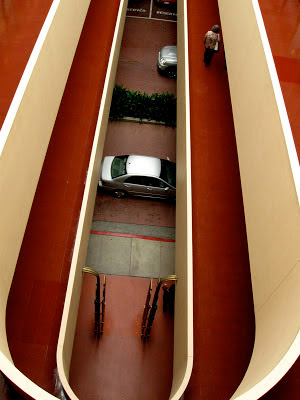 It was located on the third flood of a rotunda that connected the county administrative wing to the larger Hall of Justice courts complex. We didn't visit the Hall of Justice. Perhaps it had more people buzzing about, adding a human element and subtracting the somewhat spooky feeling of the county administration section. 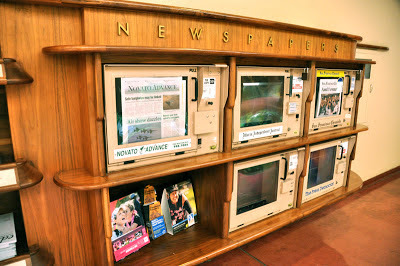 Interesting and nostalgic for me were the well-crafted built-in newspaper racks near the entrance. 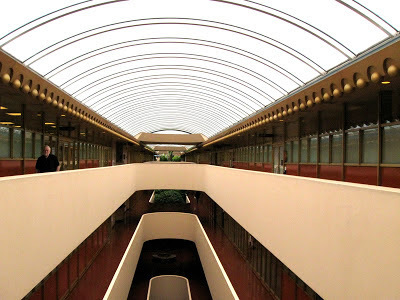 I could imagine that when the county wing was completed in 1966, the newspaper area was a busy stop, convenient for arriving employees and citizens to purchase a daily dose of local, national and world news. Now they are evidence of the modern move away from traditional newspapers as principal sources of news. Only two of the boxes appeared in use for newspapers sales. Husband Walter posted about our visit to the civic center here. It kind of looks like the movie set for a 22nd century science fiction movie. I do remember those blue roofs. When I left Florida after 3 consecutive hurricanes, blue tarps were every where. Wonder why there weren't any oranges or reds? Looks like a building from the future to me, too. Nice pics of something I probably will never see in person. That's what is so interesting about blogs. I love to look at the photos. I am embarrassed to admit in my entire life of living near this building I have never once been inside. I passed it many, many, many times and only viewed it from the freeway. The architecture is sterile fut fascinating in its own way. You captured terrific angles and perspective Linda.